Virtual New Zealand Stamps: 1971 Special Events. The commemorative issues of 1971 were divided into a list of smaller issued that appeared over the whole year. I've tried to tidy them up by issuing them in three posts. The first is on the Anniversaries & Centennaries of 1971. The second is on Special Events of 1971. The third is on Three City Centennaries. 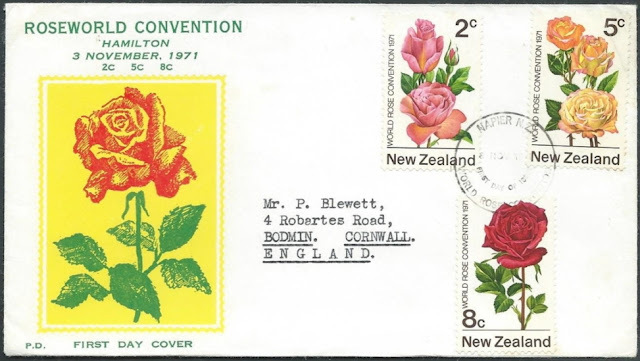 This is the 1971 Special Events post featuring three stamps issues, 1971 One Ton Cup in New Zealand; 1971 First Satellite Station in New Zealand; 1971 First World Rose Convention in New Zealand. Three interesting issues commemorating important events in the development of our country. 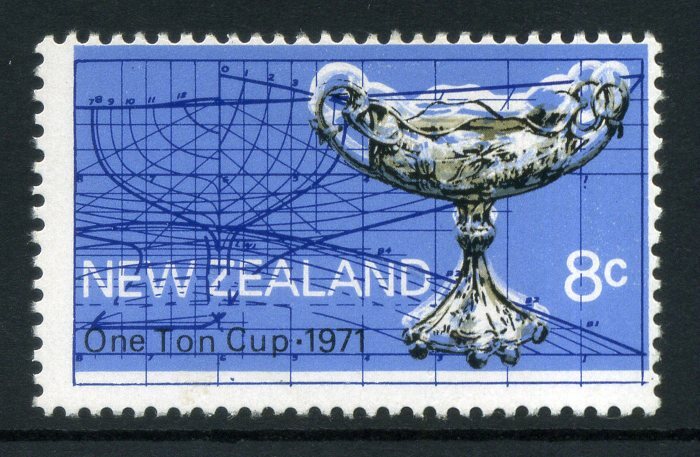 1971 One Ton Cup in New Zealand. The 'One Ton Cup' yachting contest was first introduced in 1898 and is open to all nations to enter. In 1968 at Heligoland, in West Germany, New Zealand's entry 'Rainbow II', skippered by Christopher Bouzaid of Auckland, won the event. This entitled New Zealand to stage this international race the next time, the first such challenge to be sailed in New Zealand waters. 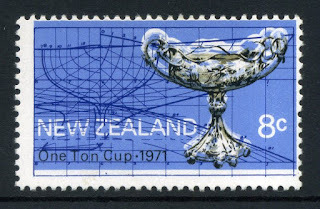 The One Ton Cup event was staged in 1971, with Auckland's Hauraki Gulf as the venue, and to mark the occasion a special issue of two stamps was made. This was a turning point for international yachting in New Zealand and paved the way for the many other great yachting achievements that would follow. 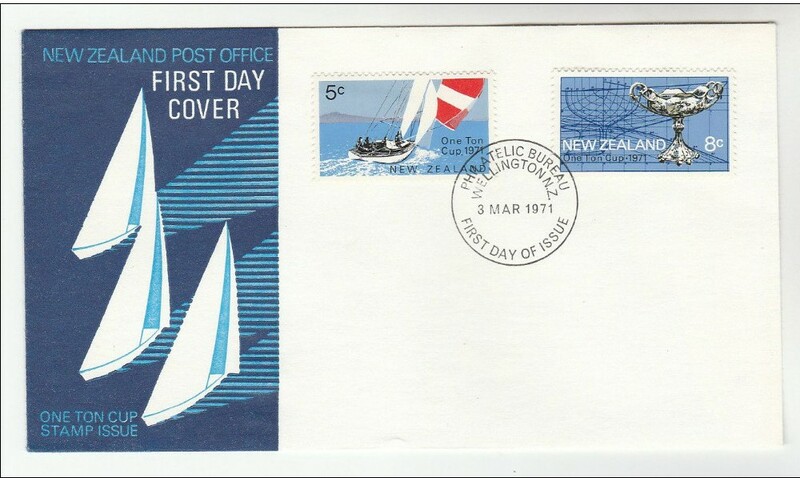 Today New Zealand is known as a team to beat in international contests and New Zealand sailors are found in various teams and private boats, all over the world. 5c - A yacht sailing in the Hauraki Gulf, with Rangitoto Island in the background. 8c - The One Ton Cup Trophy, against the architectural lines of a One Ton Yacht. 1971 8c One Ton Yachting Cup, background blue colour shifted up 1mm. First Day Cover of this issue. 1971 First Satellite Station in New Zealand. 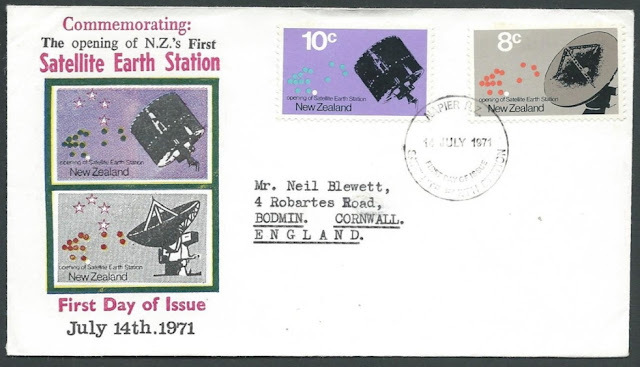 This issue commemorates the opening of the first satellite earth station in New Zealand - near Warkworth, around 80 kilometers north of Auckland. This was another major event for New Zealand because it opened up better and faster communication with the rest of the world. 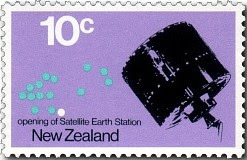 The coloured dots on both stamps represented existing satellite earth stations in the Pacific. 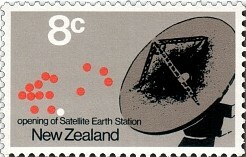 The New Zealand station is represented with a white dot. 8c - Satellite Earth Station Dish. 10c - Satellite in Space. 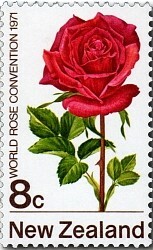 1971 First World Rose Convention in New Zealand. 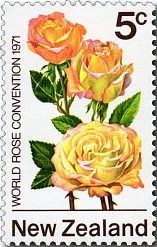 To commemorate the first World Rose Convention held in New Zealand, a special issue of three rose stamps was released. The Convention was staged in Hamilton in November 1971. 2c - Tiffany Rose. 5c - Peace Rose. 8c - Chrysler Imperial Rose. A scented American rose with salmon-pink flowers and a golden colour at the inside base of the petals. An exceptionally vigorous French variety which has achieved universal success and acclaim. The large flowers are characteristically yellow with pink edging. A fragrant American rose with deep crimson flowers which show some blue colour on aging. Technical information:- One Ton Cup held in Auckland. 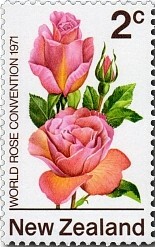 Technical information: - Rose Convention.